The Mead Art Building was a long-time dream of William R. Mead of the Class of 1867, but a suitable site was never found in his lifetime. Only after the construction of James and Stearns and the razing of Stearns Church did the proper site become available. The building was designed by James Kellum Smith '15 of McKim, Mead & White, and was finished in 1949 (King, 280-84). 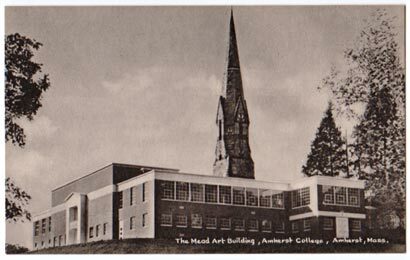 The Mead Art building is well-known for housing the famous Rotherwas Room, acquired by Herbert I. Pratt '95 and donated to the school when the building was completed. 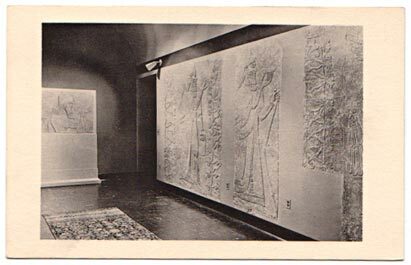 Another special room was built for the Nineveh tablets (at left), acquired by the College through Henry Lobdell of the Class of 1849, and previously housed in the Octagon and Morgan Hall. Recent renovations in 2000-2001 brought the building's storage and display capacities up to present-day standards.